In the early years of settlement, Double Bay was used as a shelter for the angler who would regularly fish around the Harbour. Nowadays, the ‘shelters’ are beautiful grand homes and old apartments. Some of the best views of the harbour can be found here. That’s where we come in as your Double Bay locksmith. Contact us today to speak directly with a locksmith who can recommend a solution for your home’s locks and security. We have partnerships with all major brands in lock manufacturers and only choose the best lock hardware the industry has to offer. Fusion Locksmiths are also fully licensed and police checked, giving you peace of mind. That total security starts with the right locksmith. Home security has never been as important as right now. So when was the last time you checked your locks? If you have recently moved in or been in your home for a long time, you need to double check the locks and security to ensure they are in top working order. Criminals have become smarter and are using more advanced tactics. You too need to stay up to date. Ask our residential security locksmiths about the latest range of security products using modern technology. With the nearby train station from Edgecliffe people can easily flock into the area. Fortunately we have been protecting homes and businesses in Sydney’s East for many years. From simple barrel changes to whole new locking systems including keyless entry, Fusion Locksmiths have all types locking solutions to up your security to suit your lifestyle. Not Sure About Your Locks? 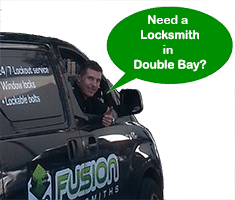 If you are not sure whether your locks are suitable or the best quality to protect your family and valuables, time to call your Double Bay locksmith, Fusion Locksmiths. With 9 years experience under our belt, we provide experienced advice after inspecting your locks. There are so many high quality locks and security products in the market, allow us to highlight some options to suit your home and budget. Just moved in? Do you know how many people have a key to your new home? No? Then, it’s time to rekey! A rekey means you keep your existing locks but we change the keys, a quick and inexpensive way to ensure your family and business is safe. Get in touch with our team now and maximise your home or business security.